XP Power is based is headquartered in Singapore and has manufacturing sites in Vietnam and China. The company makes power control systems which convert power from an electrical mains supply to a safe level to be used in its customers’ products. It sells its products into the Industrial, Healthcare and Technology sector where they are used in thousands of different applications. 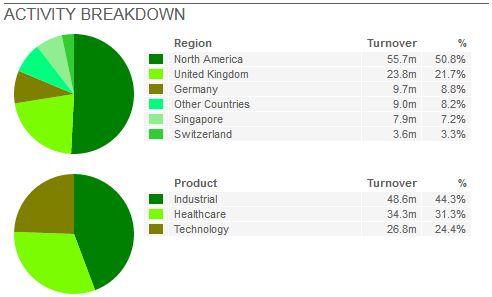 It does not have any direct exposure to the consumer electronics sector. The bulk of the company’s sales are made in North America and Europe. The company uses its own direct sales force to forge long-lasting relationships with customers whereas many of its competitors sell through third party distributors. 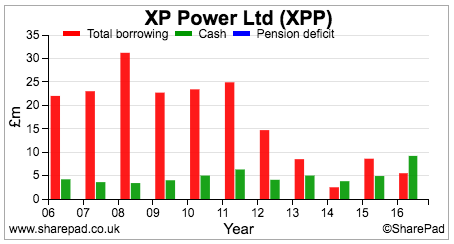 Once a product is sold to a customer, XP Power receives a revenue stream over the product life cycle which is typically 5-7 years. 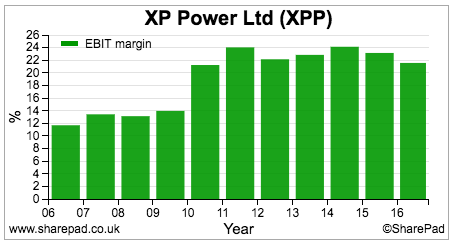 It’s easy to think that XP Power is operating in a fiercely competitive industry selling commoditised products. However, its historical financial performance is very impressive to say the least. Its profit margins are very high at over 20% and have remained very stable over the last 7 years. The company has a very low cost manufacturing facility in Vietnam and is following lean production techniques which give it a source of competitive advantage. The key question is: why haven’t these margins been competed away? What is the company doing that its competitors cannot match? Clearly, low cost manufacturing is an advantage, as is the focus on service quality and value added products. The company also spends around 4.5% of its sales on research and developing new products and has a good track record of new product launches every year. However, this is an industry where technology can change fast and change the competitive landscape with it. The directors are wary of an increase in competition at the low end of its target markets from low cost manufacturers in Asia where the barriers to entry are low. 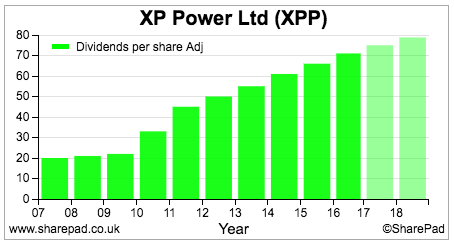 This has not affected XP Power’s profit margins yet but is a significant risk and justifies the company’s strategy of moving up the value chain. The company’s high profit margins have translated into high and impressive returns on capital employed (ROCE). Lease-adjusted ROCE was 23.9% in 2016 and has averaged 22.2% for the last decade. 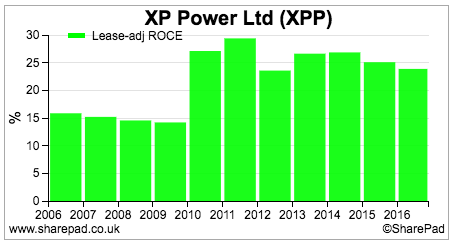 On ROCE numbers alone, XP Power looks to be a very high quality business. For the last five years, the company has also been pretty good at turning its profits into free cash flow. Before then, free cash conversion was not great, primarily due to heavy levels of investment. 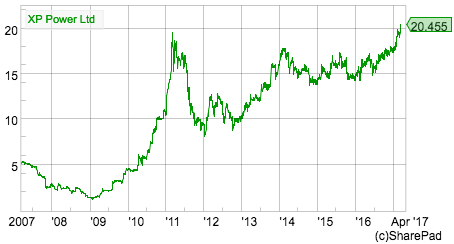 The company’s free cash flow performance has allowed it to develop a very impressive dividend track record. Since 2007, the annual dividend paid has grown at an average rate of 15% per year, although in 2016 dividend growth was 8%. The financial position of the company is very strong. It ended 2016 with net cash balances of £3.7m. Fixed charge cover was an impressive 19.5 times. 2016 was a record year for sales and profits and 2017 has started well. The company received a significant benefit from the devaluation of the pound against the US dollar. Most of the company’s sales (around 75%) are in US dollars and so this boosted their sterling value when they were translated into pounds. The average pound dollar exchange rate in 2016 was $1.38 versus $1.54 in 2017. This means the company had to sell less in dollar terms to earn £1 of revenue. Sales grew by 18% in 2017, but still managed a creditable 7% growth at constant exchange rates. With the pound currently worth around $1.22, it seems reasonable to expect another sales and profit boost from this source in 2017. However, the depreciating pound hurts the UK business as its costs (a large chunk of which is invoiced in dollars) rise faster than its revenues with a falling pound. This reduced margins in 2016 and is likely to do so again in 2017. As you can see from the table below, City analysts are forecasting another healthy rate of sales growth but with a slight fall in operating margins. The company’s growth is not all down to currency changes. Its order book was up by 21% in 2016 and it has a healthy pipeline of new products. XP Power is also moving the manufacture of low-end products from China to Vietnam in order to maintain cost competitiveness as well as freeing up capacity for higher-end products for the Chinese market. The company will also expand its manufacturing base in Vietnam to cater for the expected growth in demand for its products in the years ahead. City analysts are expecting EPS growth of 7% in 2017 and 9.1% in 2018 with continued dividend growth. Given this backdrop, the forward PE of 17.2 times with earnings backed by strong cash generation doesn’t look overly expensive. The 3.7% dividend yield combined with reasonable dividend growth looks reasonably attractive too, especially given the company’s decent free cash generation. My main concern with this business would be the sustainability of its high profit margins and ROCE. The track record and stability of both measures gives some degree of comfort but XP Power is operating in an industry which can change quickly due to changes in technology. That said, it is protecting itself with high levels of product innovation and high service levels. With many of its customers placing a high emphasis on product reliability and efficiency it will not be easy for new entrants to convince them to change suppliers overnight. 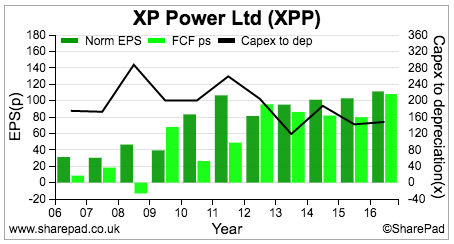 However, there is certainly scope for competition to put pressure on XP Power’s selling prices in the medium term.